I found this on Facebook at the MPO. Y’all come and give an opinion about rail in Georgia. 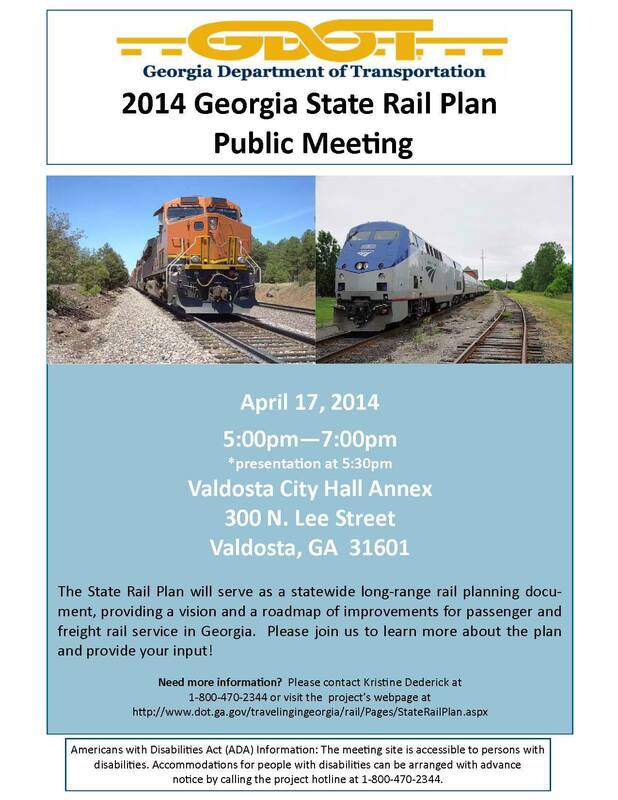 The Georgia Department of Transportation has begun work on the 2014 Georgia State Rail Plan. The Plan will serve as a statewide long-range rail planning document for passenger and freight service, providing a vision for rail throughout the state and housing comprehensive industry data. Components of the Plan will include a description of the state rail network, its related transportation and economic benefits and deficiencies, and a program of proposed public sector investments in the state rail system through 2040. The Plan is anticipated to be complete in December 2014. To develop the Plan, the Department will conduct extensive outreach to the state’s railroads, shippers, ports, transit agencies, public sector transportation planners, neighboring states’ transportation officials, and the general public. This outreach will help the Department identify potential administrative and regulatory improvements to enhance rail-related economic development benefits to the state. Public input will also be fundamental in establishing the state rail vision and guiding goals, objectives and the proposed projects necessary to realize the established vision and goals. Three public meetings are scheduled in April to introduce the project to citizens and collect their input on needs, issues and challenges, and their thoughts on a vision for rail service in Georgia. The three meetings are scheduled in strategic locations throughout the state and are listed below. All meetings are from 5:00pm to 7:00pm with a short presentation starting at 5:30pm. Anyone unable to attend the public meetings can visit the project’s website www.dot.ga.gov/travelingingeorgia/rail/Pages/StateRailPlan.aspx to view the presentation from the meeting and take a short survey to provide input. For more information on the meetings or to request accommodations for those persons with disabilities, please contact Kristine Dederick at 1-800-470-2344 or hansen-dederick@sycamoreconsulting.net. This entry was posted in Environment, GDOT, Planning, Transportation, Travel on March 25, 2014 by Gretchen Quarterman.